The Options panel of the World View page allows you to set the parameters for generating the world map. The Seed is the value used as the starting point for the random number series used to the generate the world. Each seed will produce a different world, though seeds which vary by a small amounts will only differ slightly. Seeds which vary by less than 1000 or so will probably produce worlds so similar as to be almost indistinguishable. 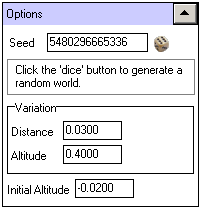 The dice button beside this value will generate a new, random seed, and automatically generate the world map from it. Increasing this will increase the amount of land on the planet and vice-versa. The default value is -0.02, which gives a slight preference for water. Changing this value by +/- 0.01 will change the water percentage by 5-15% (depending on the planet in question). The Distance Variation and Altitude Variation options control the contribution of distance and altitude difference to altitude variation. The higher these numbers are, the more ragged your landscape will be. The Distance Variation controls how much altitude changes by distance and the Altitude Variation controls how much the steepness of terrain affects roughness. The idea is that level terrain tends to be less rugged than sloping terrain. You shouldn't let these vary by more than a factor of 2 from the default values.